Born at Winnipeg on 16 April 1895, son of G. W. Baker and Jeannie Eastman, he was educated at Winnipeg public schools, at Tuckwell’s School and St. John’s College. At the age of 16 years, he played on the Winnipeg Victorias hockey team which won the Allan Cup. He also played rugby and lacrosse. From 1912 to 1914 he was employed jointly with the North British Canadian Investment Company and the Real Estate Loan Board of Canada. At the outbreak of the First World War, he enlisted with the 90th Battalion and went overseas with the 27th Battalion in 1915. He transferred to the Royal Flying Corps in England and served as a flight commander in France. He returned to Canada in 1919 and joined the bond department of Bawlf and Winslow, resigning in 1922 to organize the bond department of John Macgregor Company, which later became known as Macgregor and Baker. He later became manager of E. A. 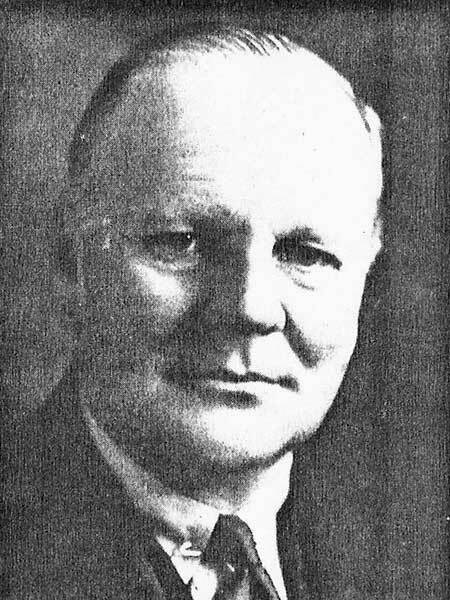 Pierce and Company, then general manager of James Richardson and Sons. From 1933 to 1936 he was vice-president of the Investment Dealers Association, and its president from 1936 to 1937. He served as President of the Winnipeg Stock Exchange (1936-1941) and the Winnipeg Chamber of Commerce (1947-1949). He was also chairman of the Board of Governors of the Manitoba Division of the Canadian Corps of Commissionaires. He served on the council of the Winnipeg Chamber of Commerce in 1941 and from 1946 to 1948, and president in 1947 and 1948. During the Second World War, he served as chairman of the first and second war loans for the prairie provinces and as vice-chairman of the National War Finance Committee. For this work he was inducted into the Order of the British Empire in 1946. In 1923 he married Jocelyn Otillie Allan, daughter of George W. Allan, of Winnipeg. They had two sons and two daughters. He was a member of the Manitoba Club, Carleton Club, Motor Country Club, St. Charles Country Club, Lakewood Country Club, and Pine Ridge Golf Club. He died at his Winnipeg home, 1199 Wellington Crescent, on 10 April 1960 and was buried in St. John’s Cemetery. “City C of C recalls fights and triumphs,” Winnipeg Free Press, 3 February 1954, page 24. “Former President of Stock Exchange is dead,” Winnipeg Free Press, 11 April 1960.